DEAR MAYO CLINIC: After my annual mammogram last year, my doctor told me that I have very dense breasts. She suggested that this year I also get a test called molecular breast imaging. What’s the difference between that and a mammogram? Why would I need it? I’m 45 and have no history of breast problems. ANSWER: Molecular breast imaging, or MBI, is a new technology that can reveal tumors in dense breast tissue that a mammogram may be unable to detect. A recent study found that in women with dense breasts, MBI significantly increased the detection rate of invasive breast cancer. So for someone like you who has dense breasts, even though you have not had any problems in the past, MBI may be a useful tool in addition to your annual mammogram. Mammograms are X-ray images of your breasts. They play a key role in early breast cancer detection and help decrease breast cancer deaths. Mammograms have long been the standard test used to detect breast abnormalities. MBI is not intended to replace your annual mammogram. Instead, it is to be used as an additional tool that can help uncover hard-to-find tumors in dense breasts. On a typical black-and-white mammogram image, dense breast tissue and invasive tumors can both appear white, making it difficult to tell the two apart. MBI images are different because before the test you receive an injection of a substance called a radiotracer. Invasive breast tumors absorb that substance more than normal breast tissue does, regardless of breast density. During the test, a special gamma camera that detects areas where the radiotracer has been absorbed is used to create MBI images. 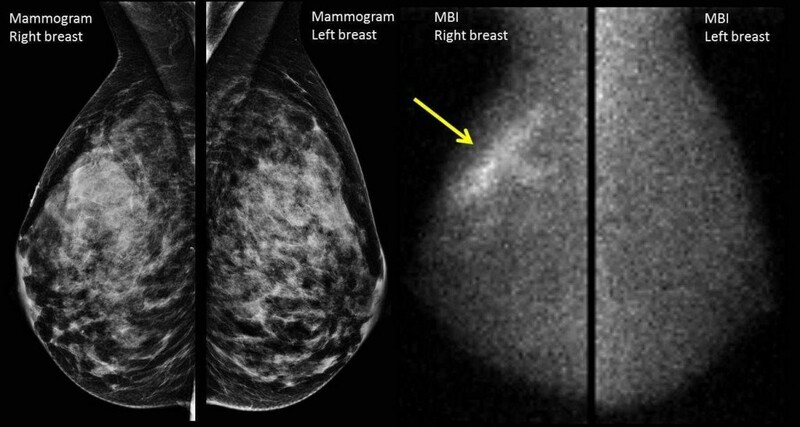 If an invasive breast tumor is present, it shows up vividly in the images because it absorbs much more of the radiotracer than the tissue around it does. The value of MBI was demonstrated in the findings of a Mayo Clinic research study published in the January 2015 issue of the American Journal of Roentgenology. The study compared molecular breast imaging to mammography and included 1,585 women with dense breast tissue. The researchers found that of those women, 21 were diagnosed with cancer: two were detected by mammography only, 14 by MBI only, three by both tests, and two by neither. These results showed a significant increase in the detection of invasive cancers using MBI along with a mammogram. Detection rates for noninvasive cancers were not significantly different between the MBI and mammograms. The study did find an increase in the risk of getting an unnecessary biopsy because of a false positive result with mammography plus MBI. With mammography alone, the false-positive rate is one in 100 women. With mammography plus MBI in the study, it was four in 100. MBI is a safe test, with few side effects. The radiation from low-dose MBI is slightly higher than that from a mammogram. But both mammography and low-dose MBI give a radiation dose that is low enough to be safe for screening and carries a very small risk when compared to the benefit of detecting breast cancer. Based on the new study results, the cancer detection rate with MBI is higher than with mammography alone. With those results in mind, MBI is a reasonable screening tool to use along with an annual mammogram for breast cancer screening in women like you who have dense breast tissue. — Deborah Rhodes, M.D., Breast Diagnostic Clinic, Mayo Clinic, Rochester, Minn.
All the best to you Kim. You have always been an inspiration to me. Awesome attitude towards life and the world we live in. Thanks for sharing.